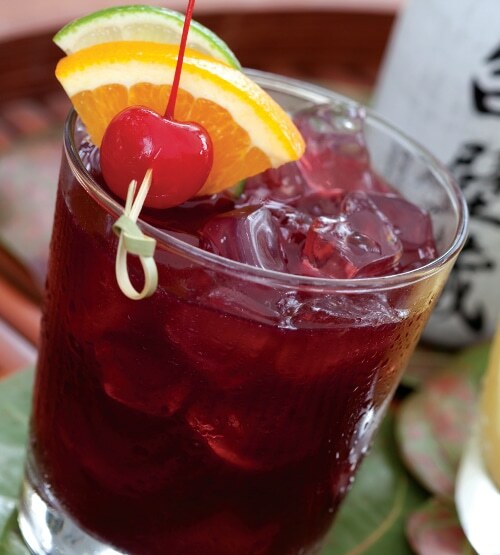 Toast to the season with a refreshing glass of Benihana Red Plum Sake Sangria. Easily prepared ahead of time, this sipper will be a hit at all of your springtime soirees. Combine all of the ingredients in a large pitcher and refrigerate until needed. Add 5 ounces of the premade mix and ice into a mixing glass and shake for 10 seconds. Pour into an English highball glass, top off with soda water and garnish with an orange slice, lime wedge and maraschino cherry.